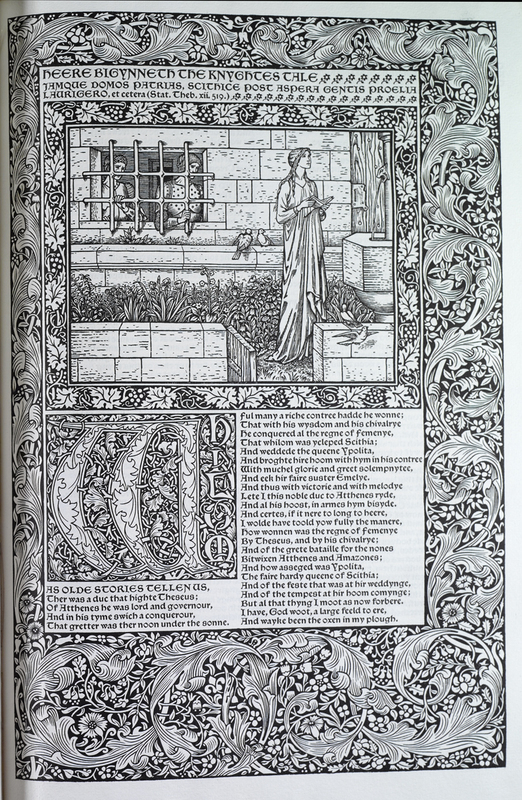 William Morris (1834-1896) turned to the idyllic medieval past as means to grapple with modernity. 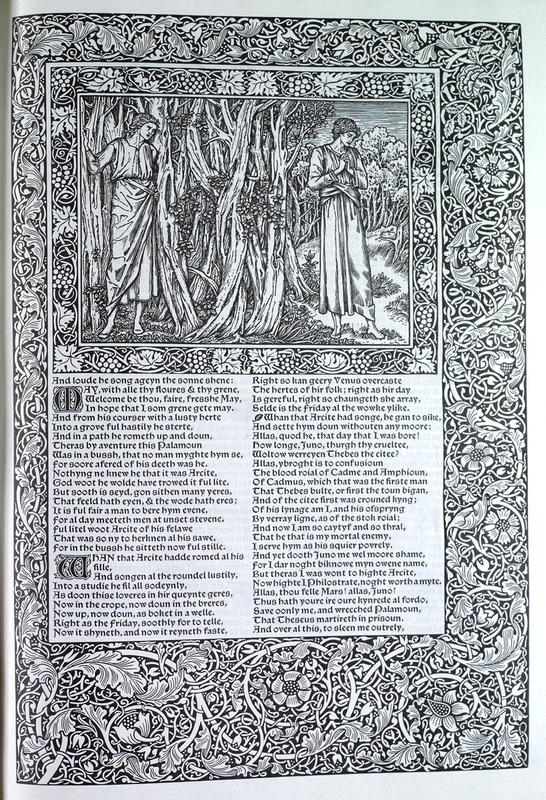 Like his cohorts, John Ruskin (1819-1900), Edward Burne-Jones (1833-1898), Dante Gabriel Rossetti (1828-1882) and a host of other writers, artists, and architects associated with the Pre-Raphaelite Brotherhood (or Sisterhood) and the Arts & Crafts Movement, Morris sought to return to the art and skilled craft of a Pre-Industrial age. 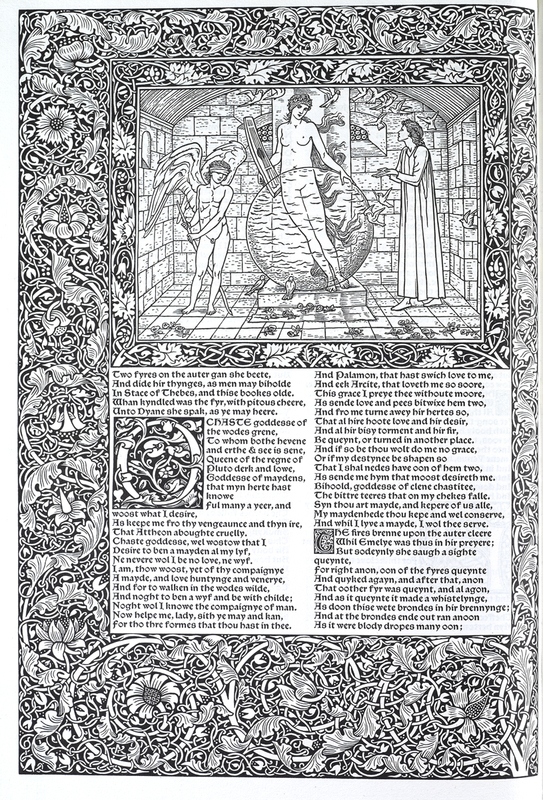 Today, Morris is perhaps best remembered for his decorative arts and furniture; however, he was also a poet & writer, political activist, a publisher, and highly influential in the art community. 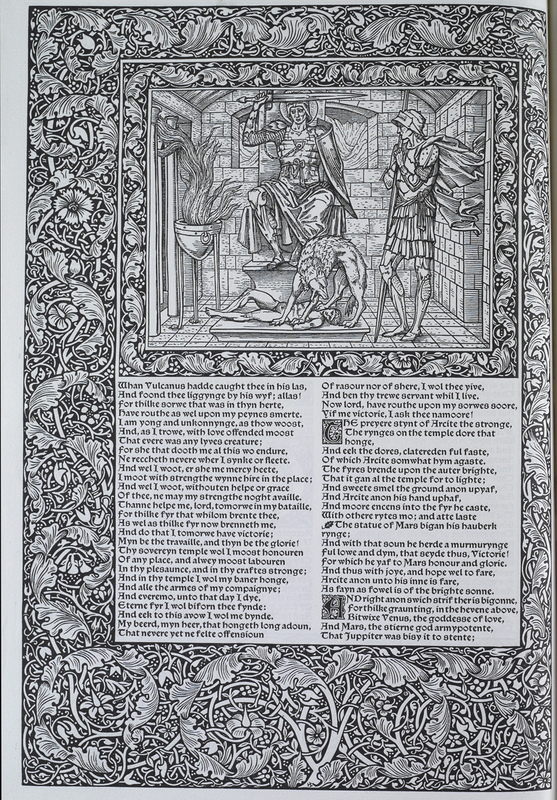 Illustration from the "Knight's Tale"
We have reproduced the illustrations for the “Knight’s Tale” from the Kelmscott Chaucer. Consider the illustrations, typography, and page layout as it compares to the medieval manuscripts. How are they similar or different? 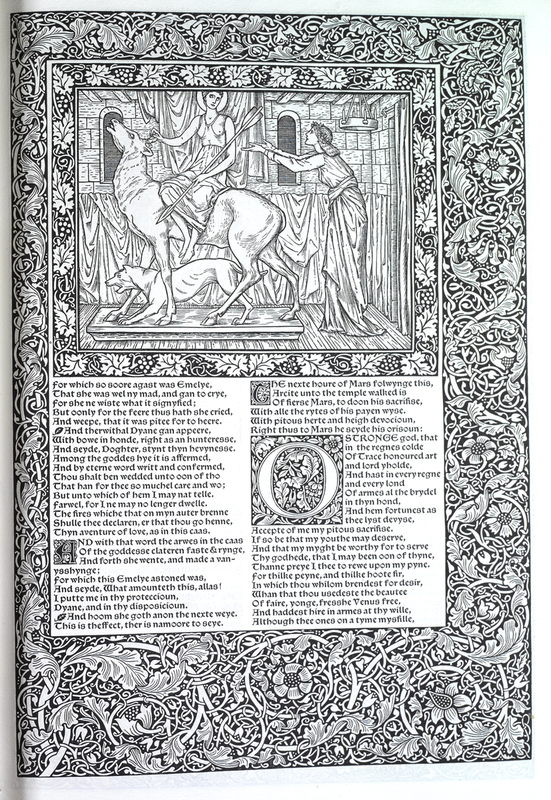 The works of Geoffrey Chaucer, now newly imprinted. 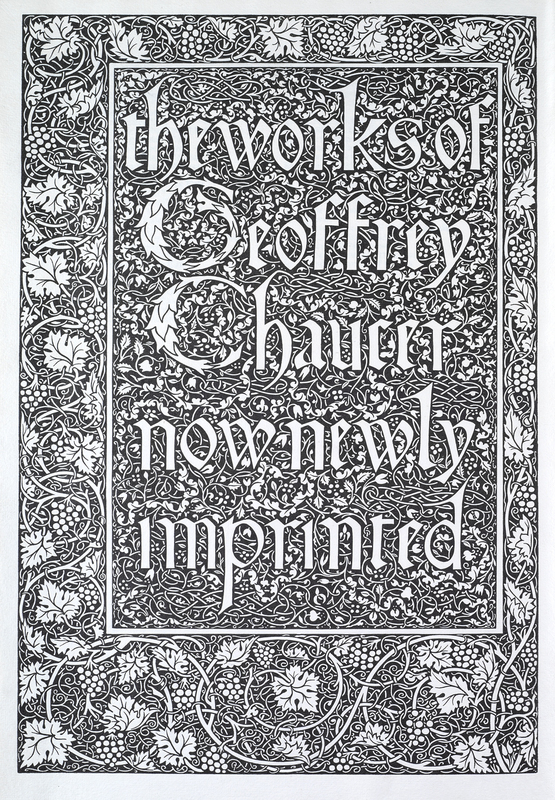 [Colophon: here ends the Book of the Works of Geoffrey Chaucer, edited by F. S. Ellis; ornamented with pictures designed by Sir Edward Burne-Jones, and engraved on wood by W. H. Hooper. 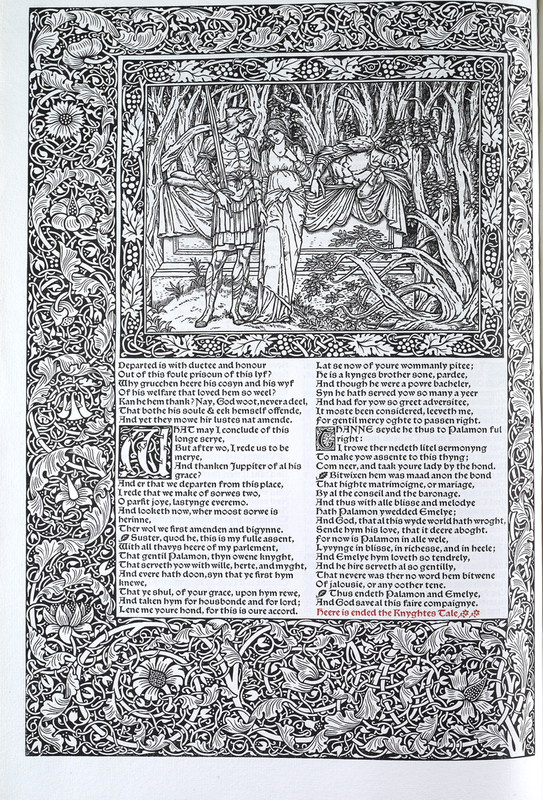 Hammersmith, England: Kelmscott Press, 1896.